2 special stamps were published. 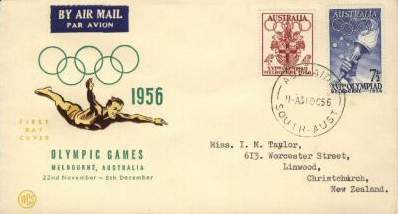 The first postage stamp featuring the Games (of two shillings denomination) was issued on 1st November, 1954. Its design was based on the Olympic poster and was printed in blue. This design was used again twelve months later but was then printed in green. The total distributed was 7,140,320. 119,309,880 of the 4d. series, 4,602,000 of the 7½d. and 7,500,000 each of the 1s. and 2s. stamps were printed. The 4d. design, showing the armorial crest of the City of Melbourne and the 7½d. showing the Olympic torch and the Southern Cross, were designed and printed by the Commonwealth Bank Note Printing Branch. The 1s. and 2s. stamps, depicting Melbourne scenes, were produced in London and Switzerland respectively by multi-colour photogravure process from colour photograph designs. On 12th November, 1956, a commemorative aerogramme was issued, of which 4,377,789 were printed. Fifty-two pictorial hand postmarkers depicting sports or venues were provided at Olympic post offices and Philatelic Bureau.